Join the Libertas Institute for their 2016 Liberty Forum on Saturday, May 7 featuring FEE president Lawrence W. Reed discussing “What Alexis de Tocqueville Can Teach Us about American Exceptionalism – Will It Last?” All attendees must register. Early bird tickets are available for $35, and general admission tickets are $50. 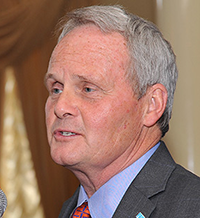 Lawrence W. (“Larry”) Reed became president of FEE in 2008, after serving as chairman of its board of trustees in the 1990s and both writing and speaking for FEE since the late 1970s. Prior to becoming FEE’s president, he served for twenty years as president of the Mackinac Center for Public Policy in Midland, Michigan. He also taught Economics full-time from 1977 to 1984 at Northwood University in Michigan and chaired its Department of Economics from 1982 to 1984. A champion for liberty, Reed has authored over 1,000 newspaper columns and articles, dozens of articles in magazines and journals in the U. S. and abroad. His writings have appeared in The Wall Street Journal, Christian Science Monitor, USA Today, Baltimore Sun, Detroit News and Detroit Free Press, among many others. “He has authored or co-authored seven books, including “A Republic—If We Can Keep It,” “Striking the Root: Essays on Liberty,” “The Great Hope,” and “Are We Good Enough For Liberty?” He is frequently interviewed on radio talk shows and has appeared as a guest on numerous television programs, including those anchored by Judge Andrew Napolitano and John Stossel on FOX Business News.